We are back in tourist town, and wow does it show! I think there are more gringos here in Cusco than in, say, Sydney!! Lots of the signs – and menus – are in English, and the prices back up to western levels. By way of illustration, our entire dinner for two last night in Abancay, which included a bottle of red wine and a pitcher of freshly squeezed papaya juice (blended? I’m not sure you can actually squeeze a papaya) cost the same as one main meal in Cusco tonight – without a beverage. And at a little grocery store in a small town on the way into Cusco today I bought three bananas, a drink, a slice of madeira cake and two little chocolate bars for less than the cost of a single 500ml bottle of water in Cusco! That said, we’ve found ourselves a cozy little hostel with very secure bike parking only a couple of blocks from the main square that seems to be excellent value. The bike is parked inside the dining room…and to get there, Adrian (again!) skilfully rode up multiple stairs and through a narrow doorway. It’s becoming a bit of a reoccurring theme this trip, the whole parking inside thing… so much so, that Adrian has already mentioned the prospect of Beamsky being in our living room when we get home. I just keep saying ‘Mm-hmm, let’s see..’…! 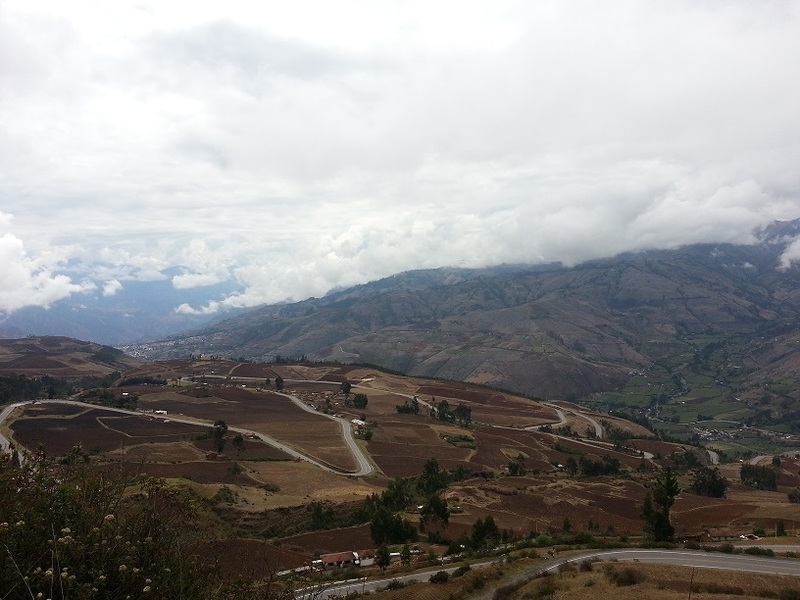 It was a fairly easy albeit very windy road into Cusco with a couple of unpaved sections towards the end that were unexpectedly rough… so it was good to be riding fresh, rather than having come all the way from Ayacucho as per the original plan. Plus it meant that we had an extra afternoon to wander around Cusco and do the sort of homey things only available in touristy places in South America, like drinking Affogatos!!! We spent the afternoon perched on the outside balcony of a pub above the main square, just people watching. It was excellent playing ‘guess which country that tourist is from’ and admiring the coordinated ‘I’m a western tourist outfit’ that many, many couples wear. You know the outfits: waterproof hiking shoes or boots – or reef sandals (with white or black socks, for some of the north European tourists. Never the Australians though; they’re more the haviana thongs type of traveller), khaki or grey pants with zip off legs and cargo pockets. A gortex Northface/Katmandu/Marmot/Colombia jacket or vest. Backpack or, for the Americans, a bum bag. Digital SLR. We saw whole groups of people wearing this uniform. It’s so funny – all the more so because we have exactly the same outfits too!! We spent quite a while in the shelter of the pub even after we’d had our fill of people watching, hiding first from the rain and then the hail. Needless to say, we were SO happy that we’d decided to push on yesterday to Abancay, otherwise we’d have been riding through torrential rain and on muddy switchbacks all afternoon. In Cusco, whole streets flooded – to the extent that walking back to our hostel involved crossing a road in water above my ankles. And sure, my gringo waterproof hiking shoes are, well, waterproof… but not when you submerge the entire shoe!! Street food in El Salvador – yum! 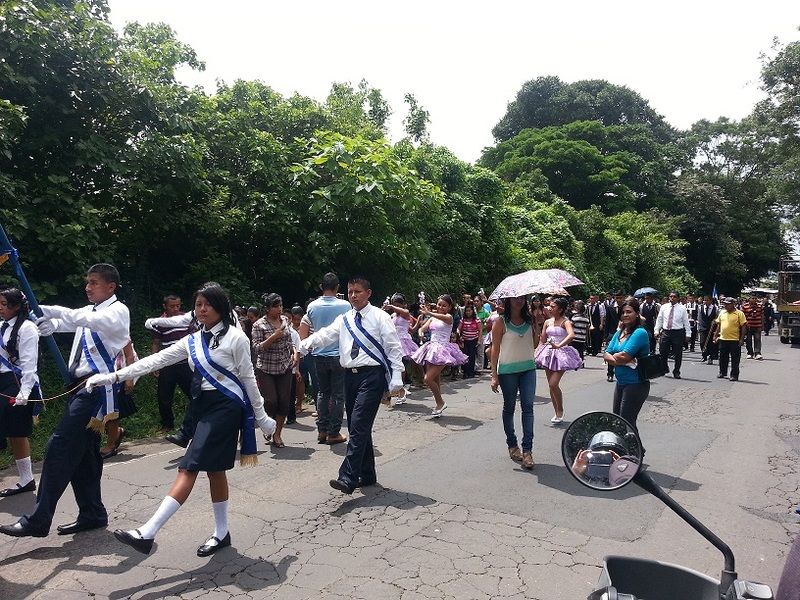 One of the many marching bands / parades blocking the road. Tomorrow is Independence Day – so the locals are gearing up for their big celebrations! El Salvador continued to improve on me this morning – getting up at 5.30am to watch the sun rise up and over the volcanoes surrounding us was definitely a good start!! Wow – it was beautiful. The coffee plantations lining the lower slopes, the almost unbelievable verdancy of the grass and the trees (so much so that it the hills almost look like they are glowing), and the morning sky is amazing… generally, it’s the only time of day without clouds (no no, not Adrian – the actual sky!). We got going later than expected because, just as we were leaving, Adrian mentioned to the owner of the hotel that we were going into town for breakfast and a coffee and he insisted on making us a coffee with beans from his own plantation. So that was pretty cool… sitting in El Salvador, looking out over the volcanoes, with a local, drinking coffee from his own plantation. And then our breakfast in town was amazing! The local speciality in El Salvador is a little savoury pancake thing (actually it’s a corn tortilla) stuffed with any number of ingredients including spinach, cheese, beans, chicken etc called Pupusa… it’s a little bit like a Gozleme – and is delicious!!! Even the fact that I was calling them ‘poops’ for short didn’t detract from the deliciousness of these little pockets of goodness. Somewhat embarrassingly, this was also the first time we’ve genuinely eaten ‘street food’ in Central America ie food from a tiny shack on the road, with a gas bottle and hotplate. I am already planning a poops bbq when I get home (although.. I may need to work on the marketing and/or come up with a new nickname for them… I can’t see my friends being too excited about any sort of food called poops!!!). We headed up into the mountains to have an up close look at one of the volcanoes, Cerro Verde. However the higher we got, the thicker the fog became… and by the time we reached the summit, visibility was perhaps 50m… so all we got to see were the flowers in the garden. For that reason, we didn’t stay up there for very long. Our way to our final destination for the day, we stopped at a lookout and met an American Harley rider, Bruce, who not only bought us lunch, but also guided us to a local beach resort town called El Tunco, where we stayed for the night. We had planned on going further, but it was already well into the afternoon and Bruce’s advice was that our planned stop was just too far away to reach before nightfall. Given one of our golden rules is no driving at night, El Tunco it was. El Tunco is a very popular surfer town and is a holiday spot for westerners and El Salvadorians (?) alike. 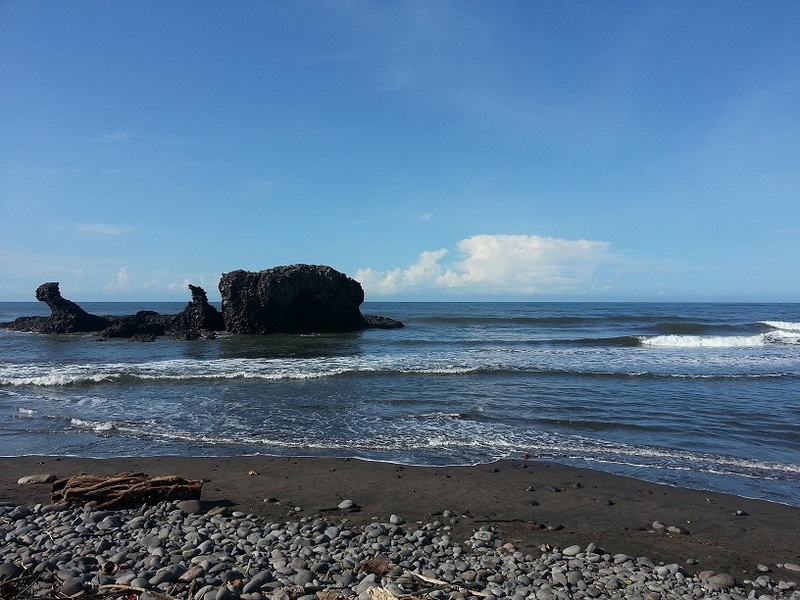 It’s a pretty black sand beach, and the town has a relaxed vibe. I overheard two girls saying that like felt ‘safer’ in El Tunco than other surfie towns nearby, because even though ‘you might get your stuff stolen’, at least you wouldn’t be threatened with a gun or machete?!! After a spot of table tennis, a walk on the beach and some dinner, that was us done for the day. All very civilised, really! An unexpected soy flat white!! Adrian riding the bike down to our cabin for the night – I told you, he loves this bike! Puerto Escondido is our last beach stop for a while… so we happy to see that the beach was very swimmable! We left Playa Ventura early, which meant slightly easier riding (not as hot and less traffic). It also meant that we arrived in Puerto Escondido at noon.. so we had the whole afternoon to just swim/relax/look around. It seems funny to me that I’m excited about a whole afternoon of chilling out etc – but after almost forty days on the road, even an afternoon off can seem like a luxurious break. Effectively, motorbike riding is our “job” for now – and even when you like your job, some unexpected time off is usually well received!! There are more tourists here – and the first gaggle of white people we’ve seen for a while. Which means it’s possibly less authentically Mexican. But it also means they serve soy flat whites… ah, you win some, you lose some!! The US medical system – a first hand experience! Adrian’s had an ulcer/lesion thingo on his tongue for the past three or so weeks that just hadn’t healed – and was getting bigger. A visit to a medical centre here in Flagstaff had both a Nurse Practitioner and GP puzzled, and they referred us to an ENT specialist. Not only did nurse and GP see Adrian, without an appointment, they only charged $50 for the consult and got us squeezed in to the ENT later in the afternoon even though there’s usually quite a wait – and they also negotiated with the ENT to give us a discount as we were out of towners without US medical insurance. So impressive – and it just kept getting better from there. The ENT was fabulous, said that it looked like something he sees all the time and he could cut it out there and then and send it to pathology. He also had one of his nurse practitioner assistants call pathology to see if they could do a deal for us – and the pathologist said yup, she’d take a look for $50. Even the ENT himself couldn’t believe it!! 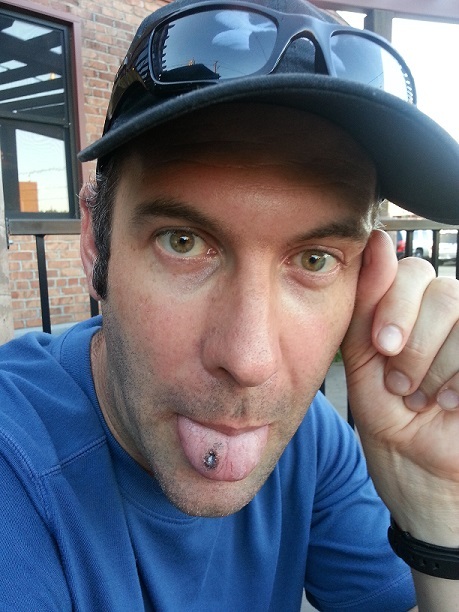 So – for the bargain basement price of $300, Adrian has seen a nurse practitioner, a GP and an Ear, Nose and Throat specialist, had a lesion cut out of his tongue and had it cauterised. And everyone we saw was fantastic – friendly, and they all really went out of their way to help. And now? He looks like someone has extinguished a cigarette on his tongue! The main thing is he’s ok – and we’ll be on our way to Tucson tomorrow as planned. 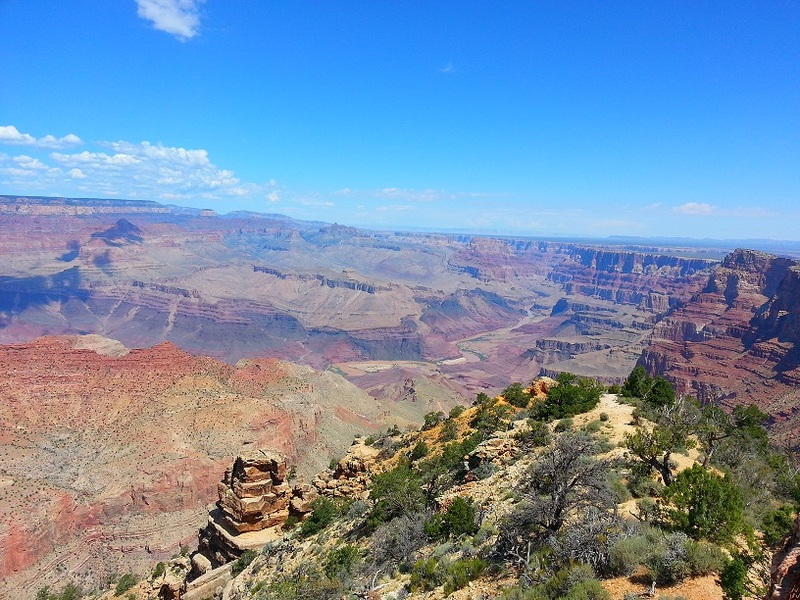 The Grand Canyon – wow! Today’s riding took us past and through the Grand Canyon… wow! It is just massive… much, much bigger than I was expecting. It’s kind of hard to describe really… on one hand, it almost looks like a massive open cut mine… and on the other hand, it’s just – well, wow! Nature can do things that we – with our best engineering minds – would struggle to achieve, that’s for sure. The Grand Canyon is a gorge of the Colorado River and is often considered one of the seven natural wonders of the world. After spending several hours in the park, we rode south to Flagstaff. We like Flagstaff! It’s a cute university town with a good vibe, nice restaurants, excellent coffee and lovely weather. We went for an explore once we’d found a motel (tonight’s ‘let’s not camp’ excuse was that we needed a decent shower after the dust storm yesterday..) and are seriously considering staying another day here. 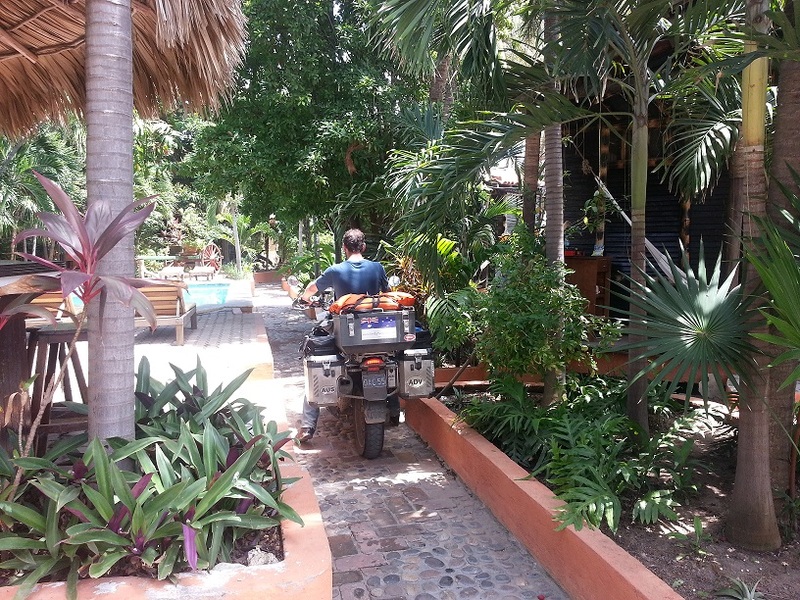 Our motorbike insurance coverage for Mexico doesn’t start for another couple of days, so we’ve got an unexpected day off the bike either here or in Tucson… which will be our last stop in the US before crossing the border! Yikes.